I strung up the guitar a few days ago. I properly set up the guitar today. I do not have any post build modal tuning I will do right now as the spectrum plot T(!,1), backed up with strobosoft are 93 Hz - 190 Hz and 244 Hz As this one's for me it kept be pushed to the back burner for other commissioned projects. But this may be my best sounding guitar. We shall see with time. The color is pretty true in the last picture of the body. I was afraid of the osage orange color. Before finishing the instrument I put it out in the sun for a couple of days. I like the warm Brown\Orange it is now. From what I have heard it will continue to darken. I still am on the fence on liking the color combination between the top and the sides. As the Osage orange darkens I am feeling better. And in light that does not pull out the red of the top it looks great. Like the picture of the guitar lying on its back. 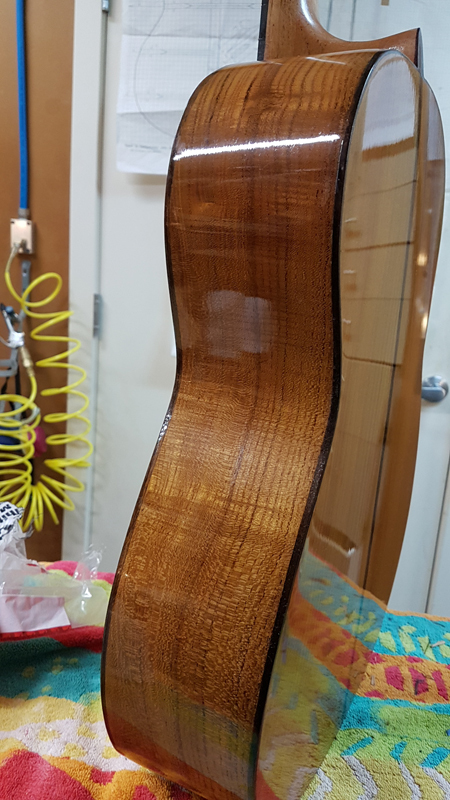 Bindings and headstock veneer Brazilian Rosewood. Traditional Shellac French Polish on top of a Silvertip Epoxy pore fill. This is one braced with falcate braces and no lower transverse bar. John that looks great. Photo reproduction doesn't give a very real view but the Osage looks fine. Lovely grain pattern. And As you say, over time any brashness will calm down. The overall aesthetic works well. I like the heel shape. 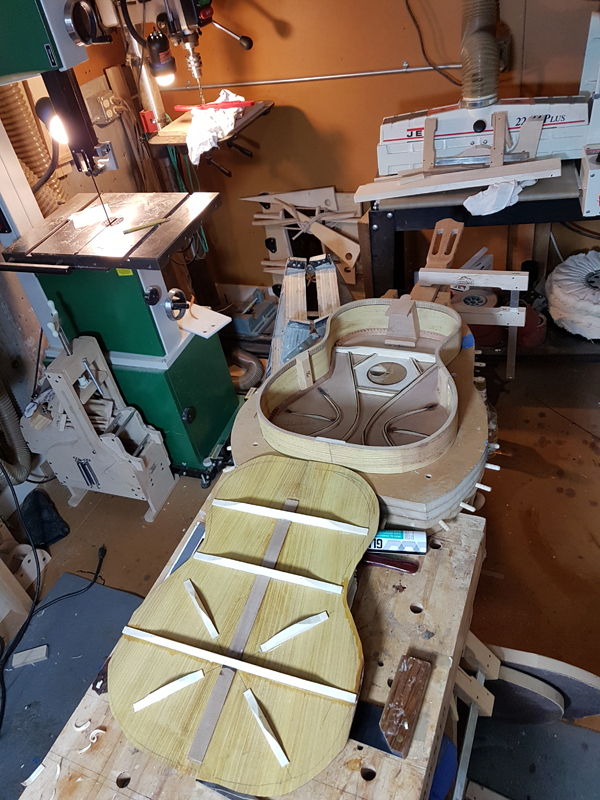 It is a bit of a regret that since I decided to always make cutaways, with 12 fret body joins that I am pretty much forced to make plain rounded heels. Of the bridge I notice that you have quite a lot of saddle showing. Is that due to trying to keep the bridge mass down? And I see that you haven't gone for the twelve hole string tie. I rather like it for the good and more regular break angle though I still have to think quite hard when putting on new strings! 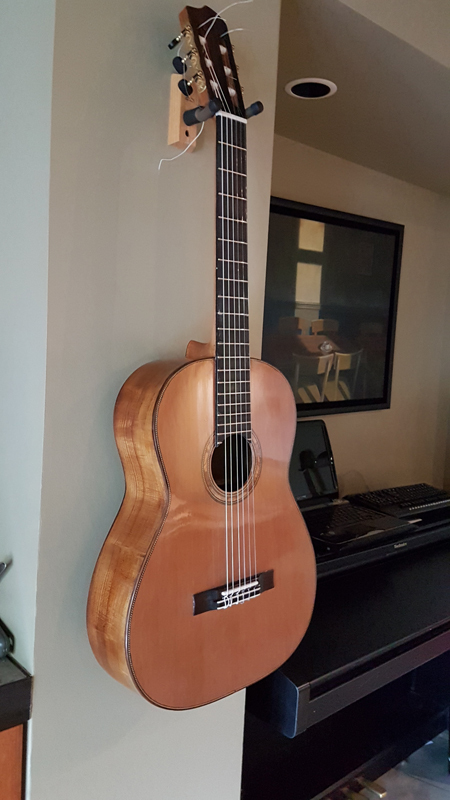 I myself have not managed a good falcate classical (though several good SS) and indeed have gone back to very light Torres style bracing. I don't remember many others on the forum talking about falcate classicals. I wonder if there are others who would share their experience...? 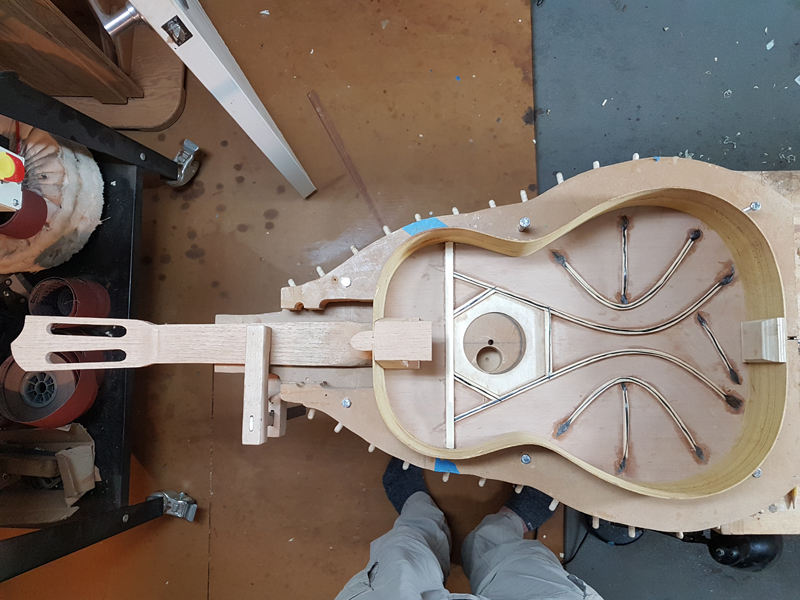 The extra saddle is mainly because I had not properly setup the guitar, Now there is about 2 mm less and it looks more normal. I only have a 6 hole bride. 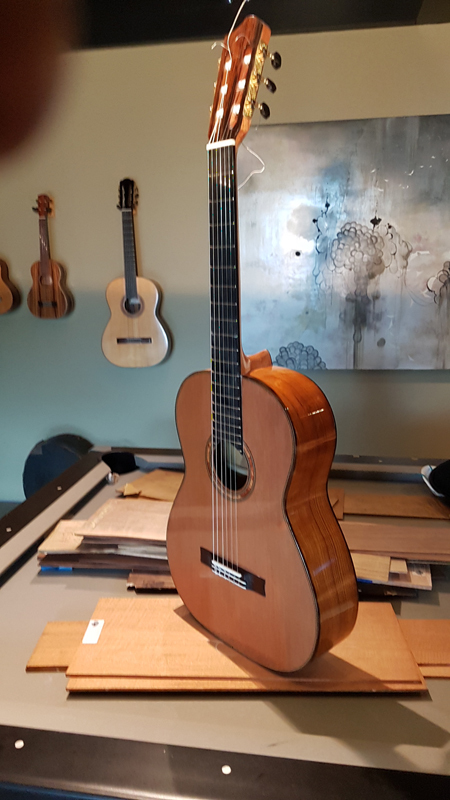 What you see in the picture is my not trimming the strings. In the first week or so I have setup strings that are taken on and off as I tweak things. When I am happy with the setup I put on a new set of strings. 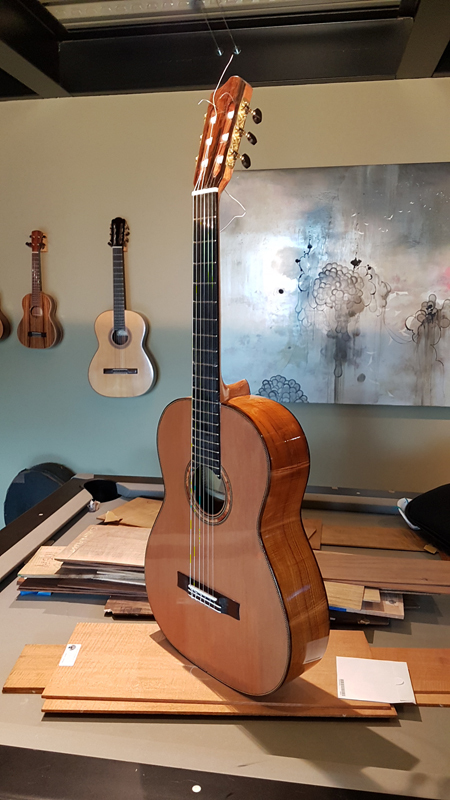 I have been happy with my classical guitars; I do find players that love the performance characteristics, but I do run in to others that really want a more traditional sound. So I get going traditional. I am lucky that I do this for fun and can experiment as I do not do this as a profession. The classical world is pretty persnickety. For classical guitars it took me a bit to really understand the bracing so I could hit my modal tuning numbers. I found judging the height of the falcate braces counter intuitive (to me anyway). 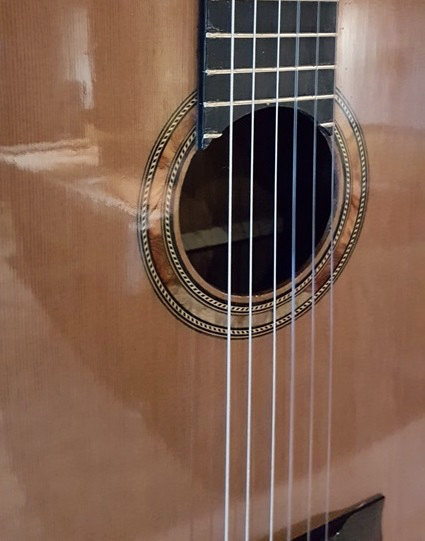 I use the same bracing pattern on the steel string with twice the load so my initial thoughts were that the falcate braces should be close to the same size. Thinking that the half load and the thinner top were about a wash. But I was wrong. The top plate is a significant part of the structural stiffness of the assembled top. The top plate may only be 2-2.5 mm tall, but it sure is wide. 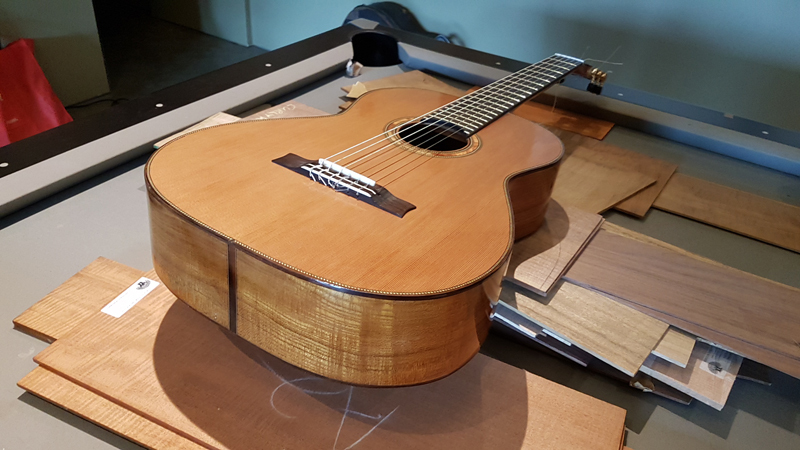 Also most classical guitars have a lower transverse brace that effectively reduces the length of the vertical braces relative to the falcate pattern without a lower transverse brace. So if you are looking at the size of a fan braced classical, forget it as the braces are significantly shorter. The stiffness of a brace changes by the cube of its length. So lengthen the brace by 30% and you get half the stiffness. The bracing pattern I use is very close to the bracing pattern for Gore's medium sized steel string. 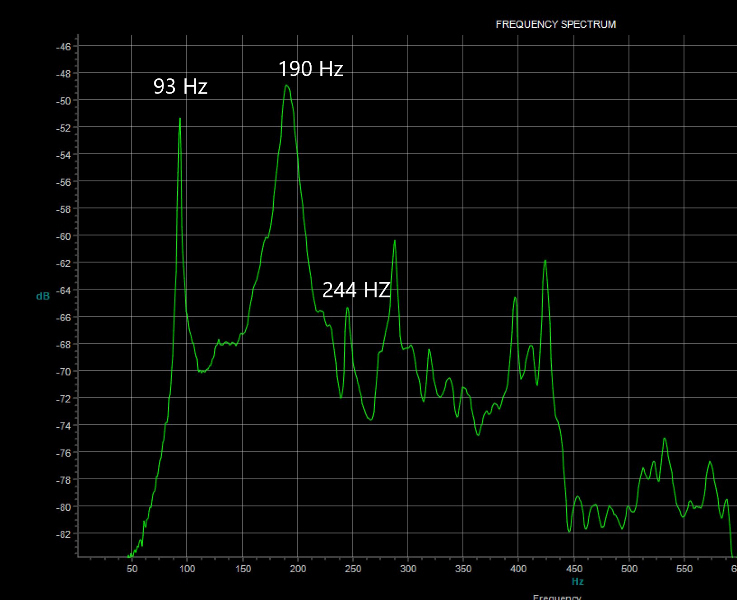 The steel string is looking for a top resonance of 170 - 180 Hz where I want the classical to be 190 Hz - 200 Hz. 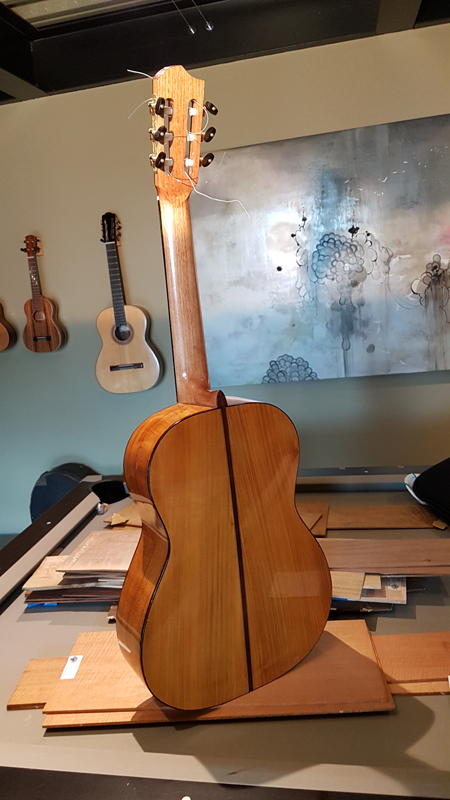 To keep the mass down the classical top is 20% to 25% thinner than a steel string using the same wood. So you want a higher resonance but you are working with a floppier top? 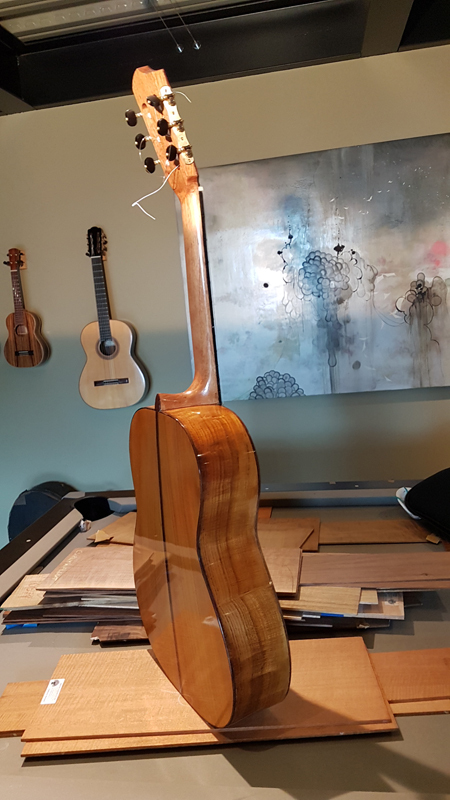 You do not want to make the top thicker as you would not get a good return on mass for stiffness so I use the vertical falcate braces to make the top stiff enough so that I get my target resonance, in this case 190 Hz. My main falcate braces for classicals are 10.5 to 11 mm tall. I also found I may be able to fine tune the resonance numbers playing with the height of the secondary falcates. But I do not really have a great feel for it. I have been playing with 8 and 9 mms. John, I love the colour of it - at least as far as we can judge from the photographs. And it will mellow, as you have pointed out. Osange orange is a timber that we just don't see here in Australia. I think I would like to try it if I could get it. The combo with WRC looks great. 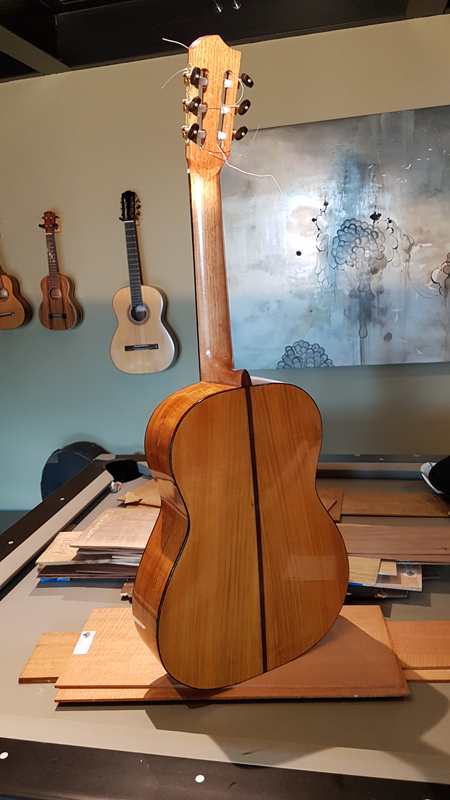 I haven’t got much experience with classicals, but I did one with an 18 hole bridge which is fiddly to make but looks great (no strings across the tie block). Let us know how the sound of this one works out.